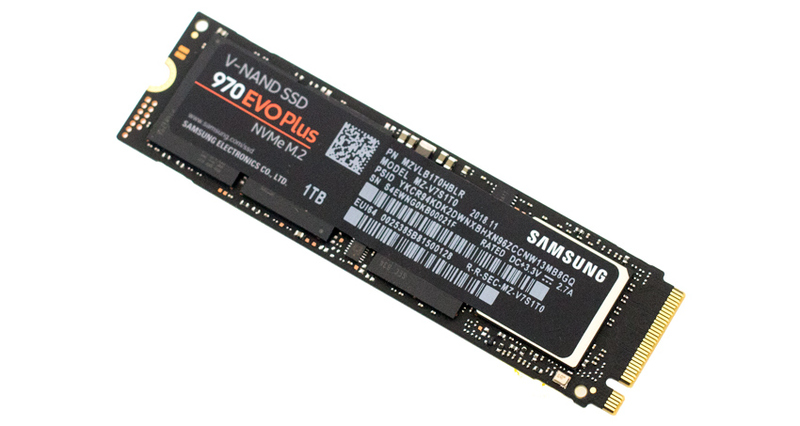 Samsung has presented the new model of its popular NVMe SSD 970 Evo series. The new 970 Evo Plus is even faster and costs just as much as the 970 Evo and 970 Pro models at their launch. Instead of the V-NAND v4 memory of the previous models, Samsung uses the memory of the new V-NAND v5. The writing speed has been significantly increased, and is now 3.3 GB/s (1 TB model), which is significantly higher than before. NVMe M.2 SSDs are many times faster than SATA SSDs because the SATA interface is not a 550 MB/s limitation. The NVMe M.2 interface, on the other hand, can theoretically transfer up to 4 GB/s if it is connected via 4 and not just two PICe 3.0 lanes, but in practice the new Samsung Evo Plus 970 NVMe SSDs have already reached the transfer speed limit, because the maximum speed for x4 PICe 3.0 (minus overhead) is approx. 3.5 GB/s. The SATA SSDs are also capable of transferring up to 4 GB/s , which is a very high speed. For the work with video, an NVMe SSD makes sense when compiling your own computer, e.g. for the operating system including programs and for large source files such as 6K/RAW videos. The Samsung 970 Evo Plus comes in three sizes: with 1 TB, 512 GB and 256 GB memory - the sequential reading speed for all three is 3,500 MB/s , the writing speed is 3,300 MB/s or 3,200 MB/s and 2,300 MB/s , respectively. Improved are also the IOPS, they are now 600-000 (4K Random Read) or 550,000 (4K Random Write) compared to 500,000 IOPS/450,000 IOPs. The TBW value (Terabyte(s) written) is given by Samsung for the 1 TB model with 600 TB a, identical to the Evo 970 - the more expensive Evo 970 Pro, on the other hand, has twice the value - the MTBF (Mean Time between Failure) is 1,500,000 h for all three model series. Another advantage of the new model is its lower voltage (1.2 volts instead of 1.8 volts) including power consumption and thus low heat generation during intensive use. The price for the new models is 259 Euro for the 1 TB model, 139 Euro for the 512 GB models and 99 Euro for the 256 GB version. For comparison: the 970 Evo (3,400 MB/s read and 2,500 MB/s write speed) currently costs in the 1 TB version 220 Euro, the 970 Pro (3,500 MB/s read and 2,700 MB/s write speed) around 311 Euro. The guarantee of all model series is five years. Whether the surcharge for the 970 Evo Plus model compared to the 970 Evo is worthwhile for the slightly higher writing speed, or whether it is of any significance at all, must be decided by each user on the basis of his specific application profile. If you wait a little, you will probably soon enjoy significantly lower street prices for the Samsung Evo 970 Plus.